Laura Bloch Bourque has lived in New England all of her life, with the exception of seven years during her early twenties when she lived on the West Coast. That is where she had a life-changing encounter, being hired as a graphic designer by a hippie from New York City named Larry Bloch. They worked side by side for seven years developing an offset printing business and then sold it to move back East and get married. During their time together they created two things of which they were always proud, their son, Aaron, and the legendary nightclub of the 1990s, Wetlands Preserve. After 25 years as a graphic designer Laura returned to school and earned a BA in Journalism. She lives in the hills of New Hampshire with her teenage son from a second marriage and has published several feature magazine stories and newspaper articles. 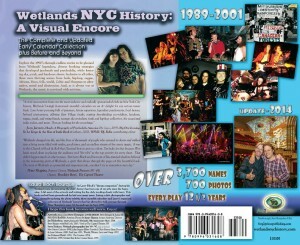 This book was produced to honor Larry’s dying request; that Laura assemble a complete record of the nightclub’s amazing history. The time was ripe when, in February of 2014, Wetlands Preserve was once again being honored, and in a big way. .. moe. at the Capitol Theater – a 25th anniversary celebration for a club that closed in 2001!